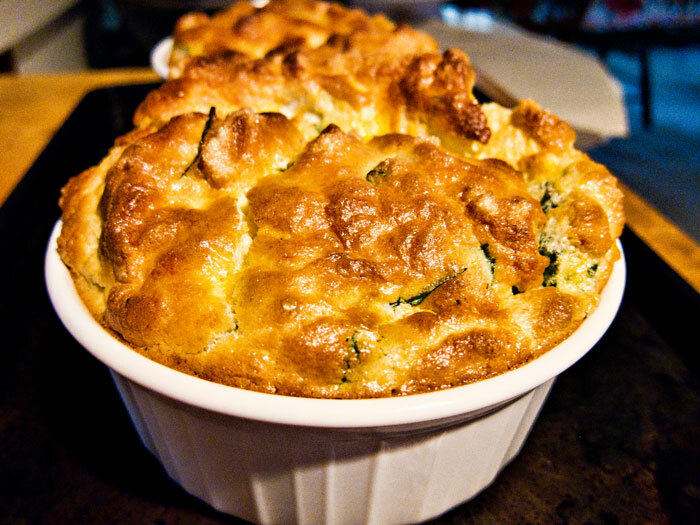 My wife made this souffle tonight stuffed with spinach. It rose really nice and had a really delicious looking outer shell. Inside it was light and fluffy. This is the first time my wife has made a souffle. The cool thing is that she is willing to try new things and see if they work or not. I think that is something we all should not be afraid to do. Let’s not let our fear and inhibitions keep us from trying new things and being a bit adventurous. I wonder what she’ll be baking tomorrow? Hooray for Irene. Souffles are difficult to make. I tried once to make one – it wasn’t pretty. I also tried once to make an angel food cake from scratch – it was light as a door stop. While we’re on the subject of cooking you should ask Gail about her famous “turkey in a bag”. She just made a chocolate souffle that was the bomb! So good!